CoPower is a clean energy investment platform whose mission is to empower Canadians to participate in and profit from the transition to a low carbon future. CoPower helps investors place capital into clean energy infrastructure projects through pooled funds that offer strong returns and predictable cash flows, along with a social and environmental impact. By investing in CoPower Green Bonds, investors can help build more community-scale clean energy across North America and earn an attractive return while doing so. CoPower’s new flagship investment product, 6 year Green Bonds, offers a 5% annual fixed rate, and are backed by senior, secured loans made to community-scale renewable energy and energy efficiency projects. *CoPower Green Bonds are currently sold out. CoPower may elect to reopen the series at a future date. Capital raised figures include amounts raised both on and off platform. The Corporation is raising funds to fund secured, first-priority, non-recourse Loans to Borrowers developing Clean Energy Projects located in Canada and the United States. Clean Energy Projects include, but are not limited to, solar photovoltaic technologies (“Solar PV”), energy efficiency, geo-thermal and geo-exchange, energy storage, bio-energy, construction retrofitting and small wind. Loan proceeds will be used by Borrowers to finance Clean Energy Projects. CoPower's Green Bonds are relatively simple debt instruments offering monthly interest payments. CoPower is offering Green Bonds with at either a six (6) year term or a and annual interest of five (5) percent per year. Other options are available including a four (4) year term at four (4) percent per year. Investors may opt to invest for either simple or compounding interest. These Green Bonds are eligible to be held in RRSP and TFSA accounts. Please note that this is not a complete investment summary. Investors should read all associated documentation including the offering memorandum and associated securities agreements before making any investment. CoPower uses the capital it receives through the sale of Green Bonds to finance green energy projects across North America. CoPower lends money to clean energy developers and energy efficient companies, financing things such as solar energy projects, geothermal heating & cooling systems, energy efficiency retrofits, and LED lighting installations. The companies financed by CoPower give people access to clean and renewable energy. CoPower itself is a financial intermediary – that is, a company that moves money between investors and companies that need capital. Its products themselves are financial products. CoPower helps companies manage change by providing the financing they need to grow and develop. CoPower also helps investors manage change by providing them with a product in which they can save their money and generate an investment return for future use. CoPower's work directly supports the attainment of Sustainable Development Goal 7 (Affordable and Clean Energy). Recent projects include solar installations, geothermal heating, and LED lighting retrofits. This investment is illiquid given the stage of the venture and given that the financing arrangements for the invested capital are going out in the form of loans. Investors could not expect to access their principal before the end of the proposed term of investment (3-5 years). This investment relies on the performance of a set of underlying assets: loans to clean energy projects for energy efficiency or new/existing projects. There is a risk that these projects may fail. CoPower has targeted mid-sized projects that have a similar risk profile to larger clean energy projects. Moreover, these assets have an underlying value, they are secured loans, and the project loan is the most senior debt obligation in the event of a default. CoPower (GP) is an early stage venture with a short operating history. There is a risk that they will not be able to achieve their business objectives, including their revenue and investment targets. The costs of operating an investment platform and associated regulatory requirements are significant. However, CoPower has been able to acquire $12 million in assets under management, and they have placed a significant amount of capital into projects. Moderate turnkey installation risk. Return on loan investment is still dependent on the completion of the overall project. CoPower only takes on retrofitting installation that are usually very short term (within 1 week for completion) that should not place excess strain on project construction. This type of investment has substantial risk. Investors should make an investment only if you are prepared not to receive any return on your investment and to lose your investment in its entirety. CoPower is a MaRS Venture Services client, and has received advisory supports from the organization since their launch. David is co-founder and CEO of CoPower. He previously worked at Inerjys, a clean energy investment firm. He has consulted for the New York City Mayor’s Office on renewable energy, was Sustainability Coordinator for the University of Toronto, and worked at the Carbon Disclosure Project. David has been named "Emerging Solar Leader" by the Canadian Solar Industries Association and "Top 30 Under 30" by Corporate Knights. David holds an M.P.A. from Columbia University and a B.Sc from the University of Toronto. Trish is responsible for capital raising strategy and execution, including product structuring and investor relations. 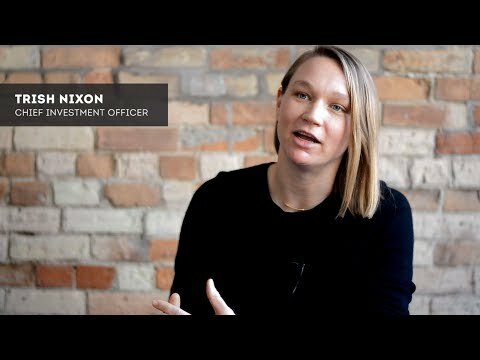 In her prior role at the MaRS Centre for Impact Investing, Trish founded Impact8, a social venture accelerator now in Toronto and Montreal, and managed venture services for the SVX, a private impact investing platform. She also led fundraising for the MaRS/Virgin Unite Impact Venture Fund. Trish is the author of "Mission Possible: Assessing the Appetite, Activity and Barriers for Impact Investing Among Canadian Foundations," and, with TD Bank, “Opportunities for Impact: A White Paper on Social Impact Investing,” among other publications. Before MaRS, Trish was a financial reporter at Reuters. She holds an M.A. International Relations from the University of St. Andrews (Scotland). Jon brings a wealth of clean energy industry experience to CoPower. Over his career working at companies like Sun Edison and RESCo, he has played a lead role in securing clean energy contracts valued at over $300 million. Jon is one of the founding executives of Emerging Leaders for Solar Energy and has served as Co­Chair of the National Board of Directors. He is also the 2015 recipient of the Canadian Solar Industries Association’s “GameChanger” Award for Emerging Solar Leader. Kathrin is founder and principal at twig energy inc., where she assists clients in clean energy and clean technology with capital raising and business development. At CoPower, she leads the assessment and structuring of clean energy investments. During her 25 years of experience, Kathrin has closed more than $5.5 billion of financing transactions as a corporate banker with Deutsche Bank and TD Securities, as a financial investor with the Business Development Bank of Canada, and as a strategic investor with Emera. Kathrin holds an M.B.A. from the University of Cologne, Germany, and is the author of The Decision-Maker’s Guide to Long-Term Financing. Junaid oversees all legal and regulatory matters relating to CoPower and provides advice in the areas of securities law, corporate law and project finance among other areas of law. Junaid joined CoPower from the Toronto office of Stikeman Elliott LLP where he advised on a variety of corporate and securities law matters including public and private offerings, M&A, corporate governance and securities regulatory compliance for a wide range of market participants. Junaid began his career in the Emerging Companies and Venture Capital group of a prominent New York-based law firm. Junaid is called to the bars of the Province of Ontario (2011) and the State of New York (2010) and holds degrees in common law and civil law from McGill University and an undergraduate degree in science and finance from McGill University. Junaid was recently honoured as the “Young Lawyer of the Year 2016” by FACL. As Director of Growth, Greg leads strategy and execution as CoPower work to engage Canadians across the country with impact investment opportunities. Greg has spent his career building and scaling innovative models of social and environmental change, as the Founder and Executive Director of Students Offering Support, and most recently, as the Manager of Energy Products at ecobee. Greg is the 2011 recipient of EY's Social Enterprise Award and holds a Bachelor's degree in Business Administration and Computer Science from Wilfrid Laurier University. As Finance Manager at CoPower, Matthew has a dual role of maintaining controls, budgets and financial reporting for CoPower, as well as informing investment strategy with financial modelling of CoPower’s products. Before joining CoPower, Matthew was a senior auditor at a large Montreal accounting firm. After completing a B.Com. at McGill University he went on to earn his CPA, CA designation. He is currently pursuing a CFA designation and has passed the first two levels of the CFA exams. He is also an avid traveler and sports and music enthusiast. As Manager of Impact Investing at CoPower, Jennifer develops and implements client growth strategies and assists CoPower’s existing green bond holders, providing support and building engagement. She joined CoPower after four years as an Associate with the Institutional Investment Management team at Phillips, Hager & North (RBC Global Asset Management), where she helped manage and monitor institutional client accounts ranging from pension plans to foundations and endowments across Canada, provided coverage for the firm’s global and emerging market equity strategies, and helped develop and integrate ESG initiatives. Jennifer also worked at BMO Capital Markets, where she gained exposure to energy and power infrastructure assets. She was the lead Energy Analyst for Project Vision, an economic development program for Togo. Jennifer holds a MBA from the University of Cambridge, where she studied under the Energy & Environment concentration. As CoPower’s manager of marketing and engagement, Lauryn is helping build a community of individuals investing for profit and planet. Prior to CoPower, Lauryn was Senior Campaigner, and half of Change.org Canada’s founding team. She managed strategy, storytelling, and email, while building an impressive track record of winning campaigns on issues ranging from refugee justice, to improving animal welfare at factory farms, to featuring iconic women from Canadian history on our banknotes. After completing her B.A. in environmental policy at the University of Toronto, she worked on offline campaigns as lead organizer at the Climate Action Network Canada. She loves train travel and has gone around (almost) the entire world, from England to Vietnam, and from San Francisco to New York. As Business Development Manager on CoPower’s Projects team, Murat sources great investment opportunities and takes part in structuring the financing of projects that both lead to a reduction of carbon emissions and generate financial returns. Prior to joining CoPower, he was involved in a broad spectrum of international cleantech projects such as developing Portugal's first virtual power plant trial and launching the United Kingdom’s first driverless pod initiative as well as its first wireless charged electric buses startup. As an advocate for sustainability, Murat led a nationwide energy efficiency project that was featured as an exemplary low-carbon initiative by the UK government and was acknowledged by the Economist and the BBC. He holds a BSc and a MSc in Mechanical Engineering from Queen’s University, a MPhil in Engineering from Cambridge University, and completed the Ignite program at Stanford’s Graduate Business School.